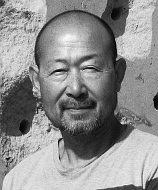 In forty years as a visual artist, I have drawn inspiration from the two cultures in which I have made my home: my early upbringing and artistic training in Japan, and immersion in the West Coast artistic milieu and the North American work and social life. My three-dimensional sculptural forms are an outgrowth of twenty years in photography and painting. In the last ten years I have pushed beyond my previous boundaries because of a renewed Japanese influence from having spent ten years in my native country. When I returned to North America, my sculpture moved in a new direction. A traditional Japanese aesthetic appears strongly in my early sculptures. These days, those influences are more subtle, but exist with vibrancy just beneath the surface. I work in simple and basic materials - stone, wood, paper and metal. These materials trigger deep connections in my imagination. My pieces draw attention to organic form inherent in natural materials, as well as the interaction of time. My work transcends the modern commercial aesthetic which tends to saturate our lives with synthetic beauty. Instead my work seeks to ground its existence in, and offer a response to, ecological, social and geographic realities. International Sculpture Symposium, Horice, Czech Republic. One of 4 finalists chosen from 110 internal applicants. Work title "Holes" 11.5' x 6.5' x 5.5' sandstone. Practitioner at the Mount Baldy Zen Center California USA where I was a translator for Josyu Sasaki Roshi who passed away at age 108 in 2012. Sculpture (solo show), Artcore Brewery Annex, Los Angeles, CA. The exhibition included eighteen small sculptures. Production of first in the series "Holes". Displayed at the Vancouver Art Gallery. Sculpture (group show), [ATLAS(T)], Gallery 53, Vancouver, B.C. The exhibition includes various nationalities of Asian origin. (by invitation). Sculpture (group show), [FAVORITES], The Moat Gallery, Vancouver,B.C. The juried exhibition includes seven artists of different disciplines. A Performance, [DIVINE SKY HIGH], Pendulum Gallery, Vancouver, B.C. The artist produced and directed the show on the occasion of annual Asian Heritage Month event. Sculpture (solo show), Pendulum Gallery at Hong Kong Bank of Canada, Vancouver, B.C. The 1st International Sculpture Symposium, Pernik, Bulgaria, (by invitation, permanent installation) The 7th International Sculpture Symposium at Europos Parkas, Lithuania, (officially selected permanent installation) Sculpture (solo show), [ASSENBLED WOOD SCULPTURE], Capilano College, Vancouver, B.C. Horsehead Sculpture Symposium, Seattle, Washington. (by invitation) Sculpture (solo show), Gallery Art & Life, Matsuyama, Japan. Sculpture (solo show), Ichiban - cho Museum, Matsuyama, Ehime. Horsehead Sculpture Symposium, Seattle, USA. Sculpture (2 - person show), [Kenneth A. LEBACK - drawing/ KAZUMI TANAKA - sculpture]. Gallery Art & Life, Matsuyama, Ehime. Sculpture (solo show). [SHAPES/FORMS], Nankinmachi Gallery, Kobe, Japan. Sculpture (group show), SCULPTURAL SYMPOSIUM for producing sculptures to help rebuilding 1996 - Earthquake stricken Kobe, Kobe. [Heritage Piece] and [Kobe 2] are installed at the public places. Installation (group show), Ushibuchi Museum, Matsuyama, Japan. Sculpture (group show), [Wind from Kagawa], Ushibuchi - Museum, Matsuyama, Japan. Photography (group show), [50 OBSERVATIONS],Tama University of Art, Tokyo. Sculpture (3 - person show), [Triad] Mamoru Abe (metal), Gerard Cox (wood), Kazumi Tanaka (stone), Hosenji Buddhist Temple, Takamatsu, Japan. Photograph (group show), [50 Observations], Tama University of Art, Tokyo. Sculpture (group show) [The 2nd "Stone Sculptures"] Stone Museum, Mure, Japan. Photograph (group show), [50 Observations], Tama University of Art, Tokyo. Sculpture (5 - person show) [Toy Sculptures with Stone] Stone Gallery MUA, Nara, Japan. Sculpture (group show), [The 1st "Stone Sculptures"], Stone Museum, Mure, Japan. Sculpture (2 - person show), [Spring Wind Travels Ten Thousand Miles] with Brid Tanaka (painting), Stone - Gallery Harajuku, Tokyo. Sculpture (solo show), [Being Playful] , Hosenji Buddhist Temple, Takamatsu, Japan. Photograph (group show), [50 Observations] Tama University of Art, Tokyo. Sculpture (2 - person show), [Spring Wind Travels Ten Thousand Miles] with Brid Tanaka (painting), Goyashiki Gallery, Takamathu, Japan. Sculpture (3 - person show), [Three Styles], Bill Vougler (ceramic), Kenichi Higasa (painting), Kazumi Tanaka (sculpture), Takamathu City Museum, Takamatsu, Japan. Sculpture (2 - person show), [Spring Wind Travels Ten Thousand Miles] with Brid Tanaka (painting), Cafe - Gallery Van, Takamathu, Japan. Photograph (group show) [The 11th Contemporary Photographic Expressions] Tama University of Art, Tokyo. Photograph (group show), Westport, Ireland. Painting (group show), Reflections Gallery, Vancouver, B.C. Photograph and Painting (3 - person show), [New Departures ? A Three Japanese Artist Show] with Masato Arikushi (wood block print Hirokazu Yoshihara (ceramic), Reflections Gallery, Vancouver, B.C. Photograph and Painting (2 - person show), [A Two Person Show] with Sven Hanna - Sorensen (sculpture), Reflections Gallery, Vancouver, B.C. Photograph and Painting (5 - person show), " X 5 ", Reflections Gallery, Vancouver, B.C. Photograph and Painting (group show), [Reflections From 41 Visual Artists], Reflections Gallery, Vancouver, B.C. Painting (group show), Graduation Exhibition, Banff Centre, Banff, Alberta. Painting (2 - person show) with Robert Oeuverd (ceramic), Banff Centre, Banff, Alberta. Photograph, Photographic Collage and Painting - (solo show), [Three Consecutive Shows], Banff Centre, Banff, Alberta. Photograph (group show), [40 Artists], National Film Board Gallery, Ottawa. Photograph (group show), [13 Cameras Vancouver], National Film Board Gallery, Ottawa. Photograph (group), [13 Cameras Vancouver], Vancouver Art Gallery, Vancouver, B.C. Photograph (group show), Pumps Gallery, Vancouver, B.C. Photograph, (solo show), [The Voyages Over The Horizon] with three slide projectors and narration, the Western Front, Vancouver, B.C. Photograph (group show), [Image 76], Washington State College, Washington. (officially selected) Photograph (solo show), [Tattooed People], Extention Centre, University of California, San Francisco, California. Photograph (solo show), [Tattooed People], The Western Front Gallery, Vancouver, B.C. Photograph (solo show), [Tattooed People], And/or Gallery, Seattle, Washington. Photograph (2 - person show) with Rigio Waki (photograph), Mind's Eye Gallery, Vancouver, B.C. BFA Degree in Graphic Design, Tama University of Art, Tokyo, 1969-1973.